Following the June 3 Dana plane crash which claimed over153 lives, members of the Catholic Church organisation, the Knights of St. John International (KSJI), in Nigeria have been thrown into mourning over the death of their leader, Prof. Celestine E. O. Onwuliri. 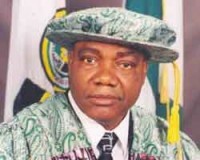 Onwuliri, former Vice Chancellor of Federal University of Technology, Owerri and husband of the Minister of State for Foreign Affairs, Prof. Viola Onwuliri, was until his death the head of the Nigerian arm of the Knights of St. John International. He was the Nigerian Supreme Subordinate President and held the rank of a Noble Major General-General in the religious, military and social organisation that has remained the pride of the Catholic Church globally. That Sunday evening, Noble Brigadier-General N. N. N. Nwanesi, Grand President of the Abuja Grand Commandery summoned all members of KSJI in Abuja to gather on Monday in the Kianji Close, Maitama, Abuja home of the fallen soldier of Christ. Since then, masses have been celebrated by Catholic Priests in his home every evening for the sweet repose of his soul. Among the chief mourners of the Abuja chapter of the KSJI is Nigerian member of KSJI’s world Governing Board, Major General Dan Anebo Okenkenta, KSJI’s national Chaplain, Rev. Fr. Raph Madu and FCT Secretary, Col. Remi Martins Nwafor. The female arm of the KSJI in Abuja, the Ladies Auxiliary, under Grand Respected President Noble Lady Theresa O. Obiakor and Secretary Lady Ify Onaku is not left out.